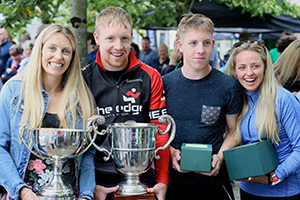 Our next #leeswimstory comes from Jonathan Kenneally! 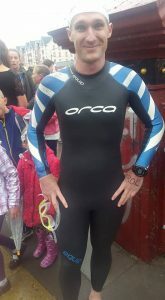 Jonathan was one of the lucky winners from our Quickest Fox Marketing Cork Hour comp back in June, bagging himself a free entry to this years swim! 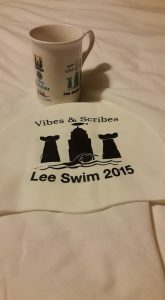 “The first time I thought about doing the Lee Swim was during my final year of college in 2007. During study sessions to distract us from the books, we put a list together of things we would do before the youngest of us were 30. Luckily, Eoin and Mark who I was studying with were a few years younger so we had plenty of time to complete the list. 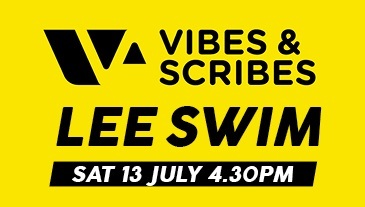 I put “Do Lee Swim” down. Not sure why I put it on the list since I hadn’t really swam regularly since I was about 10. But 8 years later I took the 1st step and signed up. 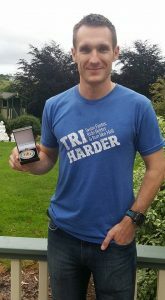 The journey to my 1st #leeswim was made possible by an unfortunate incident where I dislocated my shoulder while playing football with my local gaa club White’s Cross. This meant I couldn’t play football and needed a way to keep fit in the meantime. 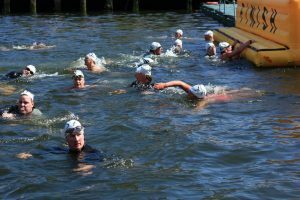 It started with cycling, then running and then to help with my shoulder I included swimming. I put them all together and started doing triathlons in late 2013. 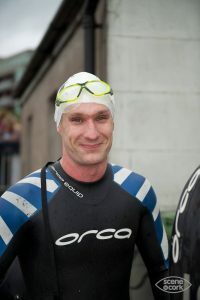 I slowly built up my swimming and confidence in open water and with the help of members of Cobh Triathlon Club and many laps in Cuskinny I knew I was ready to take on the 2km swim in July 2015. I really didn’t know what to expect but since I could do the distance I said I’d go out and enjoy myself. I had my fan club of my wife Martha and brother Damian to keep me company as we walked up to the start. I handed them my spare clothes and off I went into the competitor only area. At this time I was definitely feeling nervous. With so many people around I knew I wasn’t the only first timer so that eased the nerves. As I waited my turn, I watched everyone dive in. I was thinking how would I get in? In my mind’s eye, I could see myself doing the perfect dive but in reality when I got down the steps and it was time to go I did a belly flop and so began my 1st Lee Swim. Since the initial 1700m is downstream I needed to keep some energy in the tank for the last 300m. With this in mind I took it easy and I could see my fan club walking along the quays as I navigated my way under each bridge. The nerves were truly gone and even though it was a very wet day the support was inspiring and helped push me on. Of course when I got to the last 300m I realised I left too much in the tank and pushed home and touched the finish line. I could hear a message being played out over the intercom from my wife as I floated back down towards the steps. I was delighted I completed it and the can of coke and mug were worth it. I knew I’d be back. The following Wednesday night I was in my parents where my nana Peggy would always be on that night of the week and we talked about the Lee Swim and she told me stories of older relatives who used to do it many years ago in maybe the 50s and 60s. We had many more conversations about it in the weeks that followed. 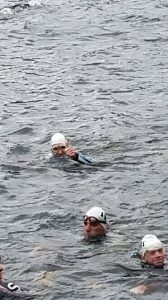 It was great to share these kind of stories and see I wasn’t the only crazy person in the family to swim in the Lee. 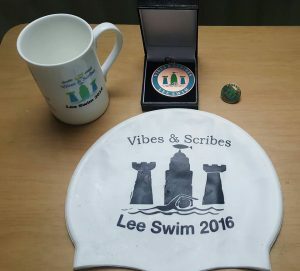 Anytime I talk about doing the Lee Swim I think of my nan and those conversations, they are great memories to have. I was back again in 2016 and that year I knew I was going to go out fast and hope I had enough energy left for the last 300m. With my wife due our first baby the following week, she stayed at home. I just hoped I didn’t have to get out half way and run to the hospital in my wetsuit. Maybe that was the reason why I ended up with a 3rd place in my age category, I needed to get home as quick as I could. It was a great surprise when I got the text and said I came 3rd. I really didn’t expect it and it is one medal I will always be proud of. So to 2017. My training hasn’t been too consistent this year, I’m too busy with daddy duties, so I’m not expecting too much this year but the main thing is to go out and enjoy myself. And to answer everyone’s questions, no I didn’t see a trolley along the way, my skin didn’t turn green, I didn’t get sick all night after and yes it is worth it and will always be on my calendar now. 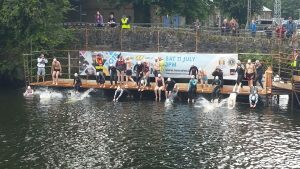 The day promises a great day out for swimmers and non swimmers- Cork’s 96FM will be there on the day to support!